The city of Burlington on Thursday announced it will team up with local and state entities to improve its response to the opiate crisis. Mayor Miro Weinberger presented 11 "opioid principles" at Burlington City Arts to describe and guide the city's approach to the ongoing crisis. The principles include basic statements that establish the danger of prescription opioids, label addiction as a public health crisis, and assert the importance of "data collection, data sharing, analysis and transparency." To effect change, the city plans to increase collaboration with the University of Vermont Medical Center, other local police departments, the Vermont Department of Health, and the Chittenden County State's Attorney's Office. "We are orienting ourselves as a city for a long-term struggle with this problem," Weinberger said. The principles will be presented to the public at a town hall meeting on March 16, and will be submitted to the Burlington City Council for approval. 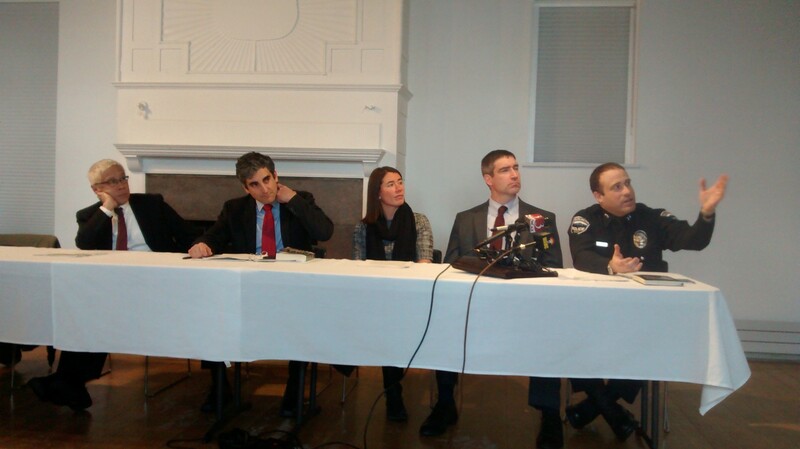 Police Chief Brandon del Pozo, Chittenden County State's Attorney Sarah George, UVM Medical Center Chief Medical Officer Dr. Stephen Leffler and Dr. Harry Chen, the outgoing commissioner of the Vermont Department of Health, joined Weinberger at the event. The efforts build off of CommunityStat, a collaboration started in November that includes regular meetings of nonprofit leaders, health care providers, law enforcement and government officials to share information and resources. This fall, the city hired opioid policy coordinator Jackie Corbally to lead the effort. South Burlington and Winooski will collaborate by collecting and sharing data of their own. Burlington's work to combat opiate abuse will emphasize data and transparency, Weinberger said. The city will release a regular CommunityStat data report, and will partner with UVM Medical Center to create a data system that includes information on how many opioids are prescribed, and by whom. In addition, the Vermont Department of Health will release to the public monthly data on opioid-related deaths. In January, Seven Days reported that a record number of Vermonters died of opioid overdoses in 2016. As part of that effort, George will also report overdose deaths to certain agencies on a week-by-week basis as her office receives word of fatalities. The efforts come, in part, in response to data analyzed by Eric Fowler of the Burlington Police Department. Among his findings: Vermont medical professionals in 2014 prescribed opiates at a rate 17 percent higher than the average in the rest of New England, according to an analysis of Medicare statistics. The data is not recent or comprehensive, but nonetheless tells a "pretty sobering" picture, Weinberger said. Fowler also presented data showing higher numbers of children in state custody, increased demand for Narcan — an overdose reversal drug — and greater stress on social service agencies as a result of the opiate crisis.